An ordination service has been held for four ministers who have been called into the pastorate in the Walewale Area of The Church of Pentecost. 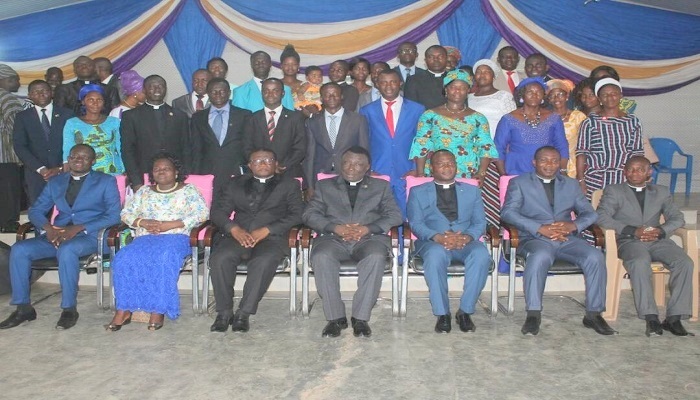 The ordained ministers were Pastors Abraham Gyabaah (Bimbagu District), Kojo Aboagye (Najong District), Richard Gavor (Kulgona District) and Emmanuel Addi Ayitevie (Nakpanduri District). The service which took place at Walewale on May 30, 2018, coincided with the ordination of 23 officers of the Church in the Area, made up of an Elder, 13 Deacons and nine Deaconesses. Speaking at the service on the topic, “Ministry in the End Times,” the Suame Area Head of the Church, Apostle Michael Collins Asiedu, called on ministers of the gospel to seek the anointing of the Holy Spirit for fruitful ministry in the end times. Using 2 Timothy 3: 1- 4 as his anchor text, Apostle Asiedu posited that the current social, cultural, economic and dispensational milieu within which pastors work presents complex challenges which were nonexistent a few decades ago. He likened the behaviour of the present generation to the behavioural characteristics of the end times which include stubbornness, blaspheming, disobedience, ungratefulness, pleasure seeking, and inordinate love for money. “To be called and ordained as a pastor in these evil times is a huge task. Thus, pastors need something greater to effectively minister to God’s flock,” he emphasized. Apostle M. C. Asiedu therefore entreated ministers to yearn for the anointing of the Holy Spirit which comes by daily study of the scriptures, personal retreat or waiting for reflections, intense and desirous prayer, holy living and fasting. This, he noted, will enable ministers of the gospel to be true witnesses of Christ, preach what they have experienced and provide spiritual nourishment and the right direction for the flock (1 John 1:1-3; Isaiah 55:4). The Walewale Area Head, Evangelist Francis Yaw Adu, on his part, commended the members of the church and the various communities in the Area for supporting the ministers to promote the work of God in their respective districts.